I was going to blog about my recent birthday trip to Italy, but I realized that there is something more important to blog about tonight. 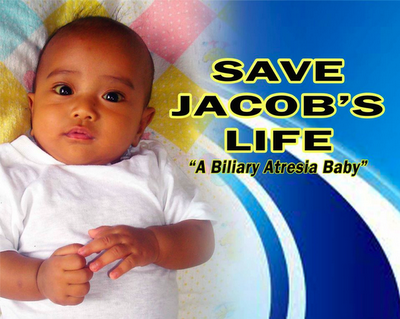 This is baby Jacob and he suffers from Biliary Atresia, a congenital disease of the liver which requires liver transplant. I don't personally know Jacob nor his parents. But I was a mother too (and still am to my nephew and my niece), so I know how hard it must be for Jacob's mother to face this very difficult situation. All I am asking is for you dear friends to please help "Save Jacob's Life". His family will appreciate any help that you can give them. Jacob Earl Feria Figueroa is son of Jeffrey Figueroa & Ernalyn Feria. A resident of Brgy. East Feria, San Felipe, Zambales, Phil. He has BILIARY ATRESIA, a congenital liver disease wherein his bile duct between the liver and small intestine is absent. At this point, the only treatment is to undergo LIVER TRANSPLANT to be done in ChangGung Hospital in Taiwan because at present there is no proper medical facilities available in the Philippines. A KASAI Procedure must have been done during his 2 months old but because of the late detection, success rate rate of this operation if done now is very poor. And without it the average life span of a baby suffering from this kind o disease usually last for 9-11 months old only. To push through with the LIVER TRANSPLANT, my family needs to raise P3M. In this regard, we would like to ask any financial assistance from you to augment the amount needed. You may contact me at tel. (047) 913-4485 or mobile 0929-889-4159. Or you may send it through my bank accounts: BPI Acct#: 002643009229 or BDO Acct#: 005830356105 under the Acct Name: ERNALYN C. FERIA. As a mother, I like to save the life of my son and through your help I know this would be possible. Thank you very much. My family is truly indebted to you.